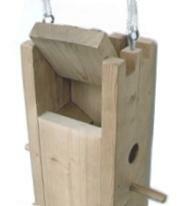 A large squirrel proof feeder with castle features accommodates 7 feeding birds at one time through 6 side holes and a feeding tray. 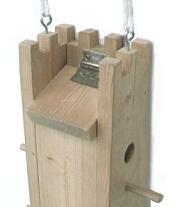 The castle bird feeder accommodates a range of bird feed types: sunflower seeds, thistle, corn, small nuts, millet or mixed bird feed. 1″ diameter x 3/4″ deep holes each above a single perch keeps bullying by larger birds to a minimum. 3/4″ thick smooth surface pine or other softwood and corrosion resistant screw construction. Do not hang from from balconies and other dangerous heights. Is heavy. All hanging objects eventually fall. Hinged roof for refilling bird seed. 1″ diameter x 3/4″ deep holes each above a single perch keeps bullying by larger birds to a minimum. Squirrels try but can’t retrieve seeds through the deep and narrow holes and eventually give up.